Having a Spare Tire on your Boat Trailer is essential. A flat can happen on a 10 mile trip the same as it can on a 100 mile trip. These Spare Tire Carriers are meant to accommodate many different frame dimensions. 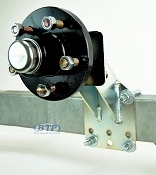 Select the one that is best fit for your trailer and be prepared when the time comes. Having your spare tire mounted to your trailer also free's up space in your towing vehicle and keeps the spare on your trailer, so switching towing vehicles wont effect your ability to change your boat trailer tire when you get a flat. Keep that Spare Tire out of Harms Way and LOCK IT DOWN! Protect that Spare Tire from the Elements! Trailer Spare Tire Carrier U Bolt with Brackets and Lock. Great for any Boat Trailer!! It is very important to remember how crucial your spare is to you. Keep in mind, that you will need this spare to operate as a regular tire. You need it to be aired up and in good physical condition. If your spare is flat and 15 years old, it won't be much use to you. 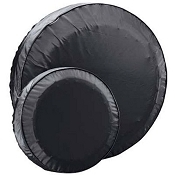 It would be recommended to use a spare tire cover to keep your tire from direct sunlight which will over time cause damage to the tires surface. Also, before you go on a trip, when checking the air pressure of your mounted Tires, also check the air pressure of your spare. You most likely won't have the ability to put more air in it on the side of the road, so preparing ahead of time by inflating that Spare to the max p.s.i as stated on the sidewall of the tire will be you safely along your way without further issues.